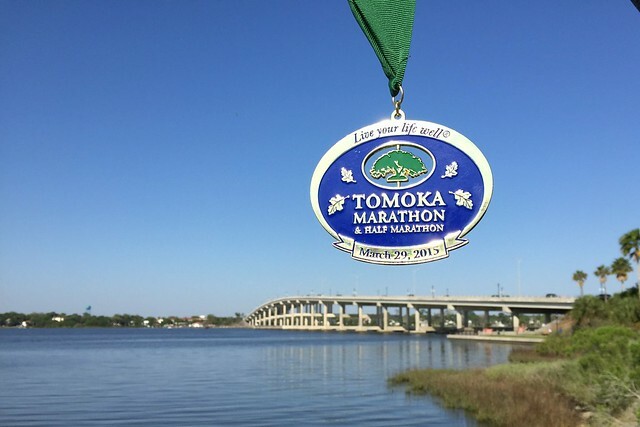 I ran my fifth half marathon on Sunday, March 29th and to be honest, I was really looking forward to this race being over. I signed up for the race on Cyber Monday because I knew a lot of ladies who were running it and it was a good deal I couldn’t pass up. As race day approached, it dawned on me that the race was about an hour and a half away, which meant a very early start to my day….bummer. Over the last couple of weeks, I also had been starting to get a little burnt out with races (come to find out this is a pretty consistent feeling among the group right now). Regardless, Saturday night came and I set my alarm for 3:35am with the hopes of getting out of the house by 4am. I picked Kayla up and we headed over to the east coast to Ormond Beach. We arrived, parked, picked up our race packet, and mingled with some other ladies. After about 15 minutes, we headed back to my car… it was COLD!! 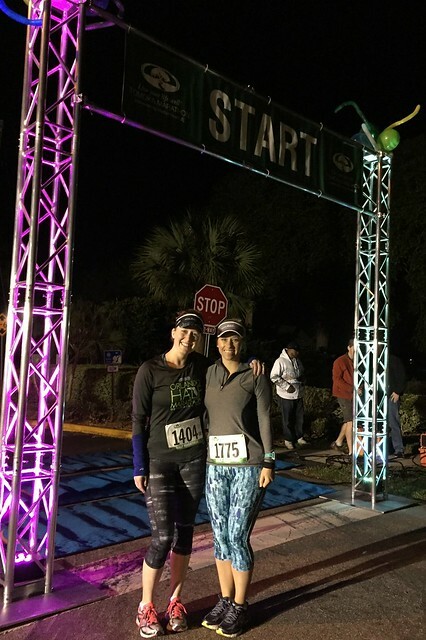 It was about 45 degrees around 6:30am so we cranked up my seat warmers and the heat and waited until we needed to make our way to the start line, mumbling and grumbling the whole time. From the start line we could clearly see another reason I was looking forward to this race being over…the Granada Bridge. 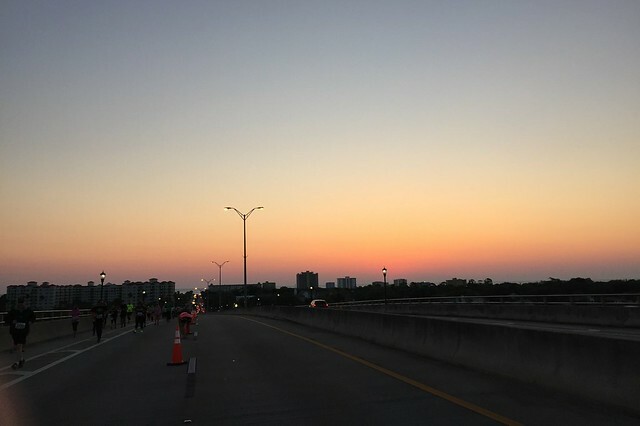 I had made a point not to look at the bridge online before the race, but that all changed when we actually had to drive over the bridge to get there. Ha! So much for not thinking about it before the race started. At the start line, Kayla and I got into our spot and were ready to go. A nice, older lady asked what time we were hoping to finish in and I said around 2 hours and 30 minutes. Kayla and I had both been very clear that we had absolutely no goal other than to finish. We were going to take in the scenery and just run for fun. The race started and we were off. 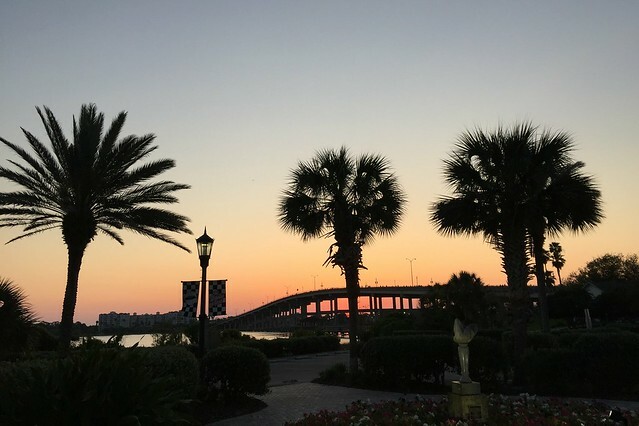 The first mile was pretty but I knew what was right around the corner… the bridge. We took some pictures and enjoyed the view once we got to the top. As soon as we got over the bridge, the sun was coming up over the water and it was absolutely gorgeous. 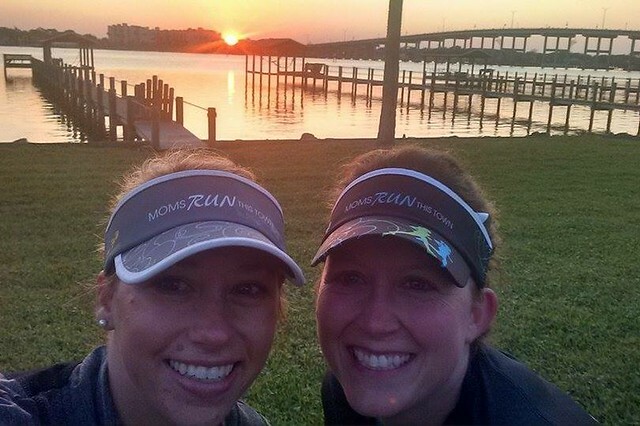 We stopped to snap some pics and take a selfie and chatted with some other runners. The next few miles were down a long, straight road with some amazing houses. 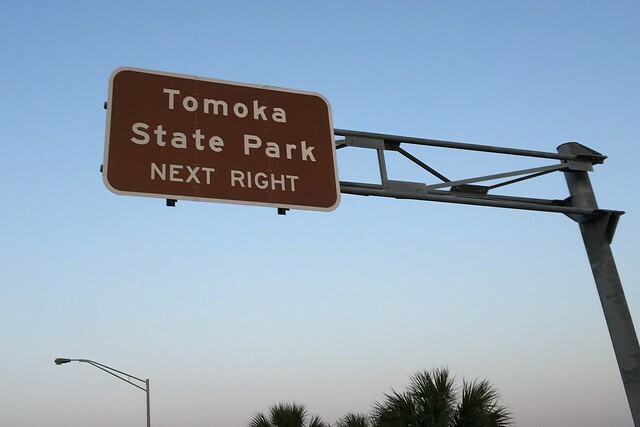 We headed into Tomoka State Park where the road turned to dirt, which I was not expecting. The turn-around was getting closer, so we were starting to see some familiar faces coming back. Somewhere between mile 5 and 6 I ate my GU (Caramel Macchiato). I wasn’t starving, but it had been quite a while since I ate my oatmeal. The turn-around for the race was between mile 7 and 8, so we were halfway done, but we still had a little bit more dirt to run on before we were back to the pavement. I was feeling pretty good, but running on the dirt was definitely taking a toll on my legs and feet. Once we left the park, we were on the road again and heading back. We were still passing some familiar faces, which was fun, and we had passed the 8 mile mark so we only had 5 miles left! We were feeling good, but also kept talking about the bridge that we had to go back over before we got to the finish line. We took a slight turn around the 9 mile mark to go down another residential road. There were several people out in front of their house, which was fun. There was zero entertainment on the course, so it was fun to see some people out cheering us on. Before we hit the main road again, we hit the 10 mile mark. It was then I realized that we had been running for about an hour and 45 mintues and my quick math told me that based on our pace, I could possibly beat my previous best half marathon time. We had originally said we just wanted to finish which is why we weren’t really looking at our time/pace, but now that I could possibly have a PR, I started to get serious…and nervous. We both agreed to just keep doing what we’re doing and see where we are when/after we hit the bridge. That bridge could make or break it and my guess was that it would break us. Ha! We took our last water break right before the bridge where we hit mile 12… one mile left and one big bridge. I checked my watch and figured that I had about 11 and a half minutes left to finish in order to get a PR. I wasn’t sure what my exact PR time was, but I knew it was 2:22:something (from OUC 2012), so I definitely wanted to get under 2:22 so I wouldn’t be cutting it too close. I mentioned that to Kayla and she told me to just go for it. I didn’t want to overdo it so I tried to pace myself up the bridge. I was panting by the time I hit the top but I was determined not to stop at this point. I paced myself down the bridge because I didn’t want to go too fast. I had no idea where the rest of the course was once I got down the bridge. We took a left and then ran under the bridge, but I still couldn’t see the finish. Finally, I turned the corner and there it was. I was so close! I pushed it over the finish line and knew it was a PR but I had no idea what my official time was. 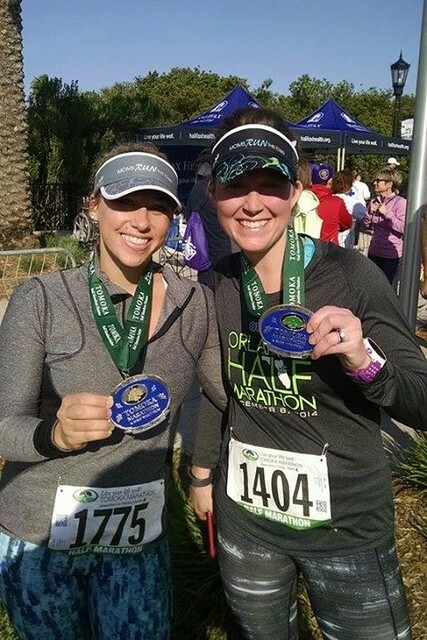 A couple of our MRTT mamas were passing out medals so it was great seeing familiar, smiling faces. I turned right around in time to see Kayla finish right behind me, a PR for her too!! We were both on cloud nine. I did not expect to do this well at all during this race. I was hoping to work to PR at one of my fall races, but not this soon. We just ran Celebration exactly two months ago and we shaved six minutes off our time, not to mention with no intention on doing so! We were stopping to take pictures in our third mile, how in the world did we do that much better than our last race? All of the early morning runs the last two months really paid off. My weekly mileage has increased dramatically and I can tell the difference. After the race, we started celebrating with beer, pizza, and Jell-O shots and waited for our friend Kristen to finish her marathon. 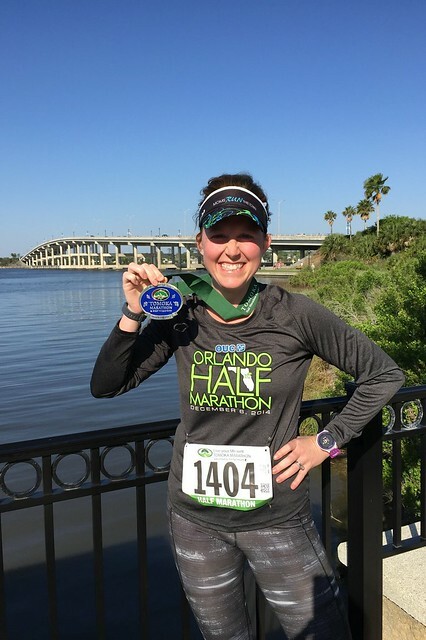 Her goal was to qualify for Boston 2016 with this marathon race and she finished 9 minutes faster than her goal. It turned out to be a fabulous day for everyone. The weather turned out to be amazing so we stayed and chatted with the other mamas about our races before we hit up Starbucks on the way home. While we were chatting, the official times were being posted. My watch had stopped for about a minute during the race so I knew it wasn’t accurate (plus it only clocked me at 13.05 miles which is really annoying). My official time (and new PR!) is 2:20:13! I surprisingly felt pretty good in the days following the race. Considering how much I was looking forward to this race being over, I am beyond excited and proud of how it went. It definitely reminded me how much I love this sport. Thanks friend! You’re the sweetest. You rock! I am getting a little nervous about the mini, so your running posts are inspiring! No matter what, I still get nervous before every race. You are going to rock it!! I’m so excited for you. Good job and congrats on the new PR!